Blurb: Two eternal lovers, Einarr and Katura come to Earth again to experience mortality as Simon and April. Simon is 36 years old and travels the world in search of antiques. April is his best friend's 16-yr old niece who believes Simon and she are meant to be together. Simon thinks she's an immature teenager and does his best to avoid her. The story follows their lives and experiences, ending when April is 80 yrs old. Review: Two souls make a choice to return to Earth, but one is reluctant. Einarr - Simon - is resistant because his last incarnation was traumatic. But Katura - April - convinces him to agree. Simon is the first to return, and by the time he meets up with April, he has already closed his heart to love. Can April make him feel again? Or will Simon (Einarr) break their agreement and seek out Earthly pleasures instead of a love that lasts for eternity? 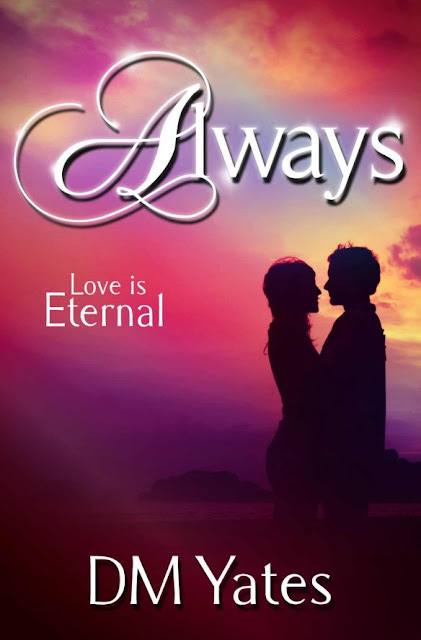 Always is a book that breaks the mold. It's far from a typical romance novel, though romance is certainly at the heart of it. The story explores bonds that span eternity, not only those between lovers, but between friends and even animal companions. The relationship between Simon and April is atypical, and one that Simon tries to avoid. It takes a lot of convincing - from April, the Duff family, Lula, and Fate - to convince Simon that he has a destiny on Earth. There are several characters in this book that I fell in love with. Jesse, Tillie, Lula - these are loyal, nurturing characters who are well-developed and likable. While most romance novels revolve around the main characters and their romantic relationship, Always follows the Duff family until April is 80 and is reunited with Simon on the Other Side. This novel will be enjoyed by anyone who believes in spirituality or the Other Side. It explores reincarnation, Wicca, religious beliefs, and spirit guides. If these are topics that interest you, Always is the book for you. What a great review and it would certainly make me buy it, if I hadn't already. try this again. a great review f a great book!